In recent years BBVA has built new headquarters at various different sites. This article provides a glimpse of how this process took place at our group headquarters in Madrid. The original reasons for the move were economy and efficiency. But it was subsequently decided to use the new headquarters as a strategic tool to bring about a shift towards a culture of collaborative work. This far more flexible and open corporate culture—strongly supported by technology—nurtures collective intelligence and encourages innovation. The “New Approaches to Work” project linked to the newly built BBVA headquarters focuses on the functional and personal needs of everyone working at BBVA. The aim is to guide the entire organization towards the goal of becoming the best—and first—genuinely digital bank; a bank capable of turning information into knowledge and offering a memorable and unique experience to each of its customers. Over the past two decades information and communication technologies have brought about a sea-change in the way we relate to one another as well as far-reaching social, economic and cultural transformations. The internet is a reality that still leaves a lot of room for discovery and surprise. This global, complex, exponentially growing phenomenon has the potential to change the status quo and even to transform its own nature. The digital era of the twenty-first century is creating its own rules of behavior and offers up endless possibilities. This means many conventional business models are now facing new challenges. Mapping the best practices of a large company onto the digital environment is no simple task. Organizations are complex systems whose operation is shaped by the people within them. The operational and business know-how of a company and its people should —and can—adapt to the new setting. The future belongs to those organizations that prove able to adapt swiftly to the ongoing changes of the digital world. Companies’ survival and leadership over the medium and long term are outcomes that will be largely determined by the decisions they take today. In the short term, acquisitions and strategic partnerships can paper over the cracks in an organization’s digital presence. But if digital adaptation is to prove competitive and sustainable over time the change must be designed and propelled by the company’s own people. At BBVA, we believe the digital transformation process requires a comprehensive, end to end approach. We must meet the needs of twenty-first-century customers and rethink our way of doing banking to take it beyond the bounds of old conventions. To implement new approaches to work, we have set in motion a range of actions designed to make life easier for our teams. One guiding principle is utmost respect for individuals. The project covers three distinct but interrelated areas: work environments, introduction and use of new technologies, and people management. Many aspects of these new approaches to work are already part of the day-to-day reality at BBVA. Our project began in 2008. Today, everyone working at BBVA has access to the new collaborative working environment, which provides cloud-based co-editing office applications and lets us take part in the company’s social network. Our corporate culture has evolved through the introduction of practices mirroring those of digital companies. Many BBVA employees have now moved to our new corporate sites, which have become powerful tools in speeding up cultural change. In the digital age organizations face a whole raft of severe challenges. This is why they need to draw on the talent of all their people and develop a form of collective intelligence2 to adapt to the new environment, achieving enhanced productivity, agility, innovation capabilities, and motivation, while interconnecting the skills and aptitudes of all the company’s collaborators. All this has been made possible by the fact that technology has enriched the ways in which individuals communicate with each other. Information and communication technologies have ushered in a new wave of social, mobile, analytics and cloud (SMAC) technologies. This young technological reality enables people to connect from any location to social networks and interest-focused communities, and provides them with the tools to manage information and share it in real time. When we work collaboratively, the likelihood of finding answers and timely solutions shoots up. And we can achieve this with the high efficiency seen in a shoal of fish or a flock of birds: every individual, faced with a threat or a change, is urged to move in the same direction by a natural mechanism. This is a behavior we must emulate. 100% of the company must be active and aligned with a common objective. Collaborative work, while increasing productivity and agility, goes beyond this: it is also key to innovation and creativity. When they seriously address this change, companies adopt a new model of relationship with their people, where the priorities are to encourage cooperation among employees, nurture their ongoing learning ability, and reinforce their commitment to strategic objectives. This effort garners decisive advantages throughout the entire process. It fosters people’s motivation and their sense of belonging to a community in which work, cooperation and sharing are rewarding and worthwhile. The quality of outcomes and decisions in collaborative work are of course largely determined by each individual’s extent of understanding of and commitment to the company’s mission and by his or her own skills and aptitudes. Another vital factor is the individual’s attitude, because cooperation is a personal and voluntary choice. At BBVA we believe that the combination of a team’s knowledge and skills creates a broader and more complete vision than multiple intelligences and abilities working in isolation. Collaborative work creates collective intelligence and provides a crucial tool enabling us successfully to face this new chapter in our history. That is why we want to make sure that the necessary conditions of collaborative work are in place. Change both arises from and takes place in people. Our task is to create the necessary conditions to nurture a collaborative attitude in the day-to-day work of all areas of the group. We have accordingly analyzed rising trends in working approaches within leading Spanish companies and drawn inspiration from the best practices achieved by successful firms to encourage collaborative work at BBVA3 on the basis of three vectors of action: spaces, technology, and the human resource management model. The main barrier to be overcome in any transformation process is resistance to change. We therefore needed to acquire an accurate understanding of people’s habits, ingrained practices and usual pathways of action. We needed to be aware of how people were predisposed to change and how their motivations might influence the outcome. To help us gain these insights, we carried out an ethnographic study consisting of intensive fieldwork in the form of workshops and in-depth confidential interviews with individuals. This research was conducted on a sample designed to reflect the plurality and multicultural diversity of BBVA’s staff. 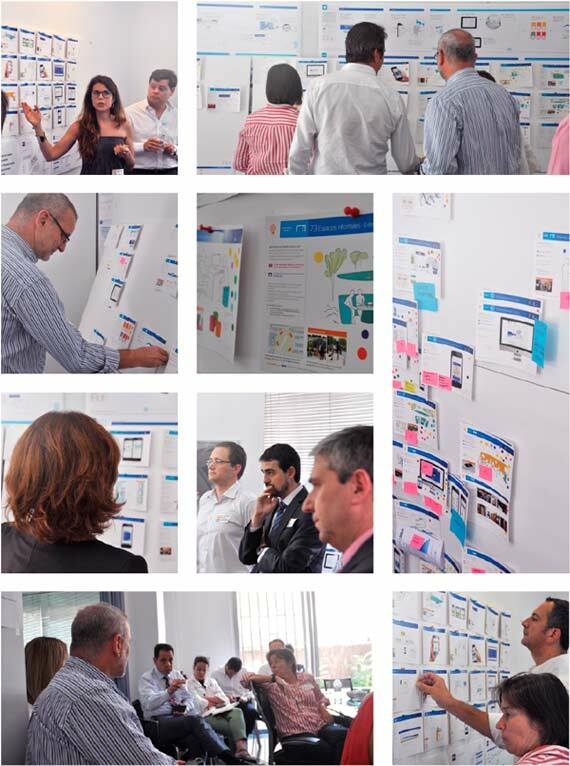 This rich source of information enabled us to understand the functional and emotional needs of BBVA’s people. 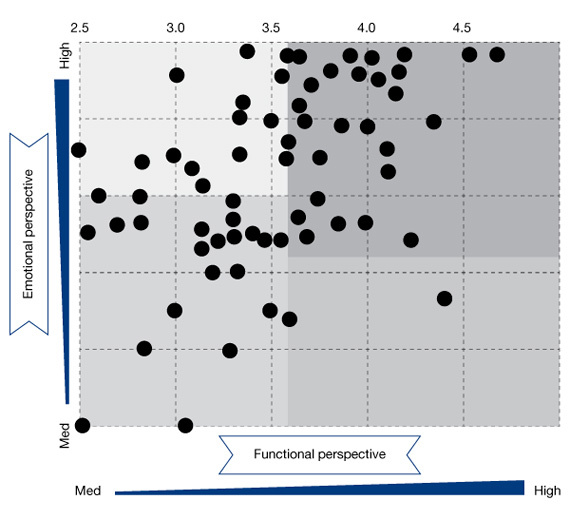 We examined functional needs from the perspectives of both mobility and information access. 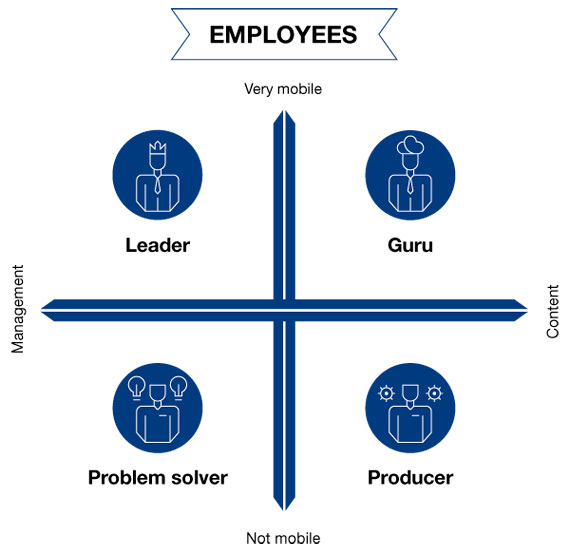 We discovered that regardless of a person’s rank within the company functional needs were classifiable into four categories: leader, guru, problem-solver and producer. When considering emotional needs, we avoided any sort of oversimplified socio-demographic analysis whereby we might have labeled people by generation and taken for granted that everyone within a given generation behaves the same way. We specifically assessed attitudes to technology adoption and willingness to accept change. We did not classify our people on an individual basis. Instead, we drew up notional profiles on the basis of people’s starting point with regard to the digital transformation process we were about to undertake. These profiles were predicated on two scales: innovative-conservative and analog-digital. The new on-the-job experience at BBVA was intended to be all-inclusive so as to encourage collaborative work. Its design accordingly had to meet the needs of the sixteen study profiles (given that each functional profile can be found in combination with any of the four emotional profiles). The solutions we came up with addressed all three concerns targeted by the “New Approaches to Work” project, and had to be consistent with one another. We found that employees’ day-to-day work experience starts out from the tangible and evolves towards intangibles. The physical environment directly affects our comfort, attitude and state of mind. Digital-era technology shapes the way we work, communicate and relate with one another. Finally, everything we do is enveloped by corporate culture, urging us into action towards a shared vision (chart 2). BBVA has almost 160 years of history behind it. Over this time, more than 150 different entities have been merged into the organization. As a result, the group occupied a very large number of buildings. In Madrid alone, in early 2010 our people were spread out across twelve different sites. A comprehensive process of space streamlining offered us significant cost savings and increased efficiency. In addition, most of our buildings were located in entrenched city cores. This meant that the opportunity to enhance efficiency was compounded by the gains to be made from moving to suburban areas. The decision having been made, we might have done no more than relocate within each of the cities where we operate, or refurbish the existing facilities. But we took a far more ambitious approach. Why not make a radical change in the way in which we work and live together? In answer to this question, the company conferred strategic status on this project. At the start of this race towards change one of the most important lines of work embarked upon was the design of buildings, common areas, and work rooms. The new spaces had to reflect the way we are and the way we understand business. They had to be designed with a focus on people, and invite people to interact. We wanted simplicity—no outward or inward status symbols—and a distinctive identity imbuing every corridor and corner of a building that would welcome us both as professionals and as people. Every space had to be functional and practical for us to do our business, while offering comfort and being respectful towards the environment. To try out the effectiveness of the designs we ran a pilot test. 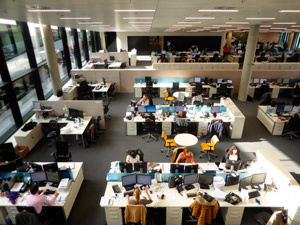 We conducted our tests at widely diverse workplaces: BBVA’s first innovation center; the La Moraleja Campus, our main training site; the branch office network, to gather information about customer perceptions; Tres Cantos Technological Data-Processing Center in Madrid; and, finally, in a building adjoining our present corporate headquarters on Madrid’s Paseo de La Castellana, to ensure that the new spatial designs were supportive of head office work. Our pilot test enlisted the active participation of everyone who at the given time was at work at our various sites, regardless of their function or organizational rank. The new spaces had to reflect the way we are and the way we understand business. They had to invite people to interact. The highly encouraging results of the pilot test led us to introduce the initiative elsewhere: additional tests were run at our sites in London, New York, Asunción, and Lima. This helped us create a new workplace structure to leverage the end to end transformation we had envisaged. The experience enabled us to produce the first version of the Corporate Space Manual, the content of which was applied during the construction of BBVA Compass Plaza Houston, our corporate headquarters in the United States. This step forward taught us a key lesson: any reshaping of space must aim at a soft landing. Intelligent management mitigates people’s sense of uncertainty, lays to rest various fears, and encourages involvement. The first moves took place in July 2013. By October, the transfer of close to 1,900 people had been completed. The key milestone in terms of business consequences was moving the Group’s main cash management desk—this was achieved without incident. The lessons learned from this big push forward informed our second version of the Corporate Space Manual, which we published in advance of further moves to La Vela in Madrid and new headquarters in Mexico City, Santiago (Chile), and Buenos Aires. By late 2015 more than 17,000 employees will be working in a new environment designed to foster a more collaborative and digital-based experience. La Vela attracted a large number of visitors. As a result, many of our teams chose not to wait for the move and instead remodeled their existing buildings on the pattern of the new spatial design, leaving behind the conventional model. The path we have taken goes far beyond a mere redesign of workstations and meeting rooms. It entails a new way of “living” together. And, what’s more, it provides a stimulus for each one of us to develop new capabilities, face new challenges, and undertake new creative processes. The design of our new work environments was guided by three main criteria: the environment, consistency with brand values, and the fostering of collaborative work among people. The criteria, what’s more, were to be global in scope: all BBVA headquarters had to be restructured in the same way. As a result all our buildings around the world provide a uniform experience. There is no need for corporate logos or colors—as soon as you walk into one of our sites you immediately sense the BBVA “character.” Any of our employees, regardless of their place of origin, will feel at ease in any of our buildings. They will recognize the entry systems, the elevators, the transparent meeting rooms, the open plan workstations, the brainstorming sessions. They won’t need extra time to adapt, or special guidance—they’ll fit right in straight away. Pathways within buildings are identical across all headquarters, from entry points, workstations, meeting rooms, and lounges to other communal areas. These principles inform the overall structure, interior decoration, and furniture, and can even be seen in minor details, such as built-in electronic noise canceling systems that lower the volume of people’s conversations. Quality, comfort, human factors, and simplicity are the hallmarks of all our headquarters buildings. Entry points are people-friendly. Security checks on entering and leaving the building are quick and easy, and follow a protocol designed to protect people in the event of evacuation. Regular and pre-accredited visitors can self-register using the booths in the entrance hall—this prevents long waiting lines. At any BBVA Group headquarters building you can identify yourself using a conventional swipe card, your fingerprint, or the NFC (Near Field Communications) chip in your phone. Openness and transparency are features of all our spaces—meeting rooms, workstations, and informal lounges. Before designing the meeting rooms we considered the question of what sort of working dynamics we wanted to encourage. As a result we devised several different configurations, ranging from small hotspots for private calls —furnished with just a table and a telephone—to very large meeting rooms equipped with state-of-the-art videoconferencing systems and collaborative co-editing tools. Personal workstations are positioned along collective workbenches which are free of any physical or visual barrier between colleagues. The design dispenses with the conventional concept of an “office” in favor of an open space. Informal lounges are furnished with small armchairs and coffee tables to facilitate casual interaction and dynamic meetings conducted on the fly. To give BBVA headquarters a standardized image, in communal areas we installed screens, video walls, and totems that provide passers-by with useful local information. One very powerful approach within the process of end to end transformation is to design open spaces that encourage an exchange of insights. We placed special emphasis on the need for each of these spaces to receive natural light and integrate with natural elements so as to help our people to concentrate and hold friendly, productive meetings. The search for the most suitable setting for our headquarters led us to create services that make life easier for our people. 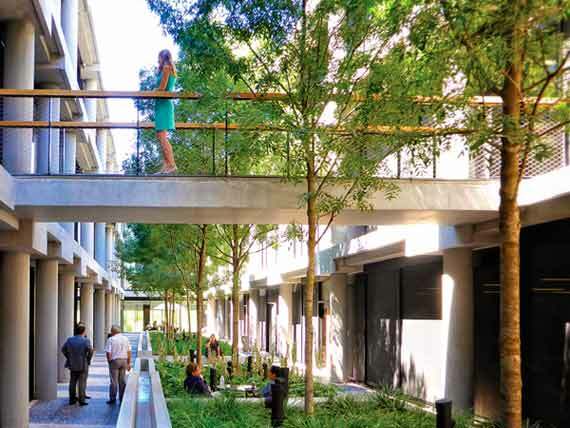 For instance, our buildings are supported by urban mobility plans that enable our professionals to commute easily, whether using public transit or their own means (bus lines, walkways and covered passages connecting to our buildings, and so forth). Restaurant and catering venues are available in the neighborhood and even within the workplace itself. All public locations—restaurants, cafés and plazas—provide meeting points and are equipped with mobile connectivity to enable use as informal workplaces. 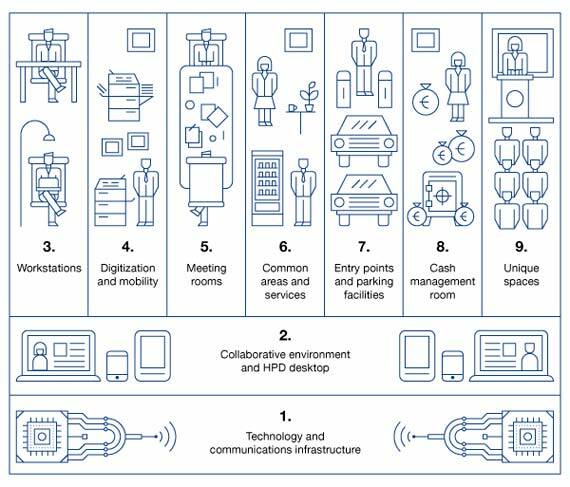 Design and technology have evolved the workstation from being an individual, concrete point to becoming an array of location choices, both within and even outside the workplace. BBVA has always been concerned with nurturing a good work-life balance for our people. Our headquarters accordingly had to be equipped with day-to-day services (tax advisers, pharmacies, dry cleaning, shoe repair, online purchase delivery points). Family-related services, such as kindergartens and infant schools (on-site or at third-party facilities), provide support for employees with parental duties during school vacations. One of the options that our employees value the most is the availability of spaces for enjoying time off and healthy living. BBVA headquarters embrace sports facilities and places for meditation and relaxation, enhanced by ongoing programs focusing on suitable exercise, nutrition, and healthcare. To optimize employees’ use of these services, in 2014 we launched our app Hoy Necesito (“What I Need Today”). Starting out as a one-stop shop for service requests, the app evolved into a central point of access to all services available to BBVA people at any of our headquarters buildings around the world. Embedded in the collaborative work setting, the app looks at the user’s digital profile and order history to help them fill out the new request and offer other services they might want. 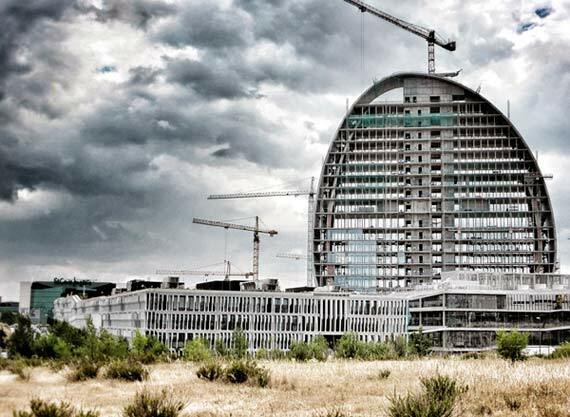 The move to a new Group headquarters was an ambitious project involving almost 6,000 people spread out over a large number of buildings in Madrid. The program had to be comprehensive, embracing all our professionals, to help them adapt, forestall issues, and deal with potential misgivings. When someone switches to a new workplace, they may feel disoriented and unsettled. To prevent this, we set up a website to help our people become familiar with the new headquarters and the details of the upcoming move. We created a personalized assistance plan for the “pioneers” (known as “blue jackets”). We also formed a small group—dubbed the “BBVA Discoverers”6—to look after the human and emotional aspects of the move. This role was entrusted to a team of slightly over 100 carefully selected people. The features required were a highly positive attitude to change, a high degree of recognition among colleagues, and the ability to spot problems in advance. This “discoverer” initiative became the key to unlock the whole process of adaptation. Organized into 15-member “expeditions,” the pioneers got to know La Vela while it was still under construction. The adventure of moving to a new building proved a fun, rewarding experience. Once back at their usual work locations, the discoverers shared their experiences with their colleagues, teams, and bosses. They helped people see the move in a positive light—but for their role, this might have been impossible. When the first buildings of the new complex were finished the “discoverers” undertook an even more meaningful task: they walked their department colleagues through the process of the move and shared their earlier experiences with them, so helping people to avoid stress and fears. They also served as a conduit to communicate the concerns, issues and suggestions arising in the course of the first round of relocations. This feedback helped improve performance in the later stages of the move. 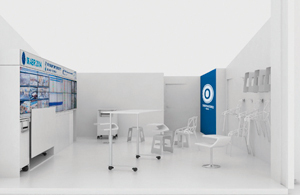 Because the “discoverers” experience had turned out so well, we created a specific team dedicated entirely to improving the day-to-day running of the headquarters—making sure people were happy there, responding to their concerns, complaints and suggestions, and conveying the BBVA experience to visitors to the complex. In addition, we set up a Governing Board comprising members drawn from different departments. The Board meets regularly to coordinate fresh moves of employees from other sites, evaluate the success of each move, and draw any appropriate conclusions that might improve the process in future. This Board—a prime example of collaborative work at BBVA—has been replicated at other major headquarters of the Group. The new Group headquarters in Madrid, designed by the highly regarded Herzog & de Meuron partnership, provides a unique opportunity to bring into being the paradigm shift we set out to achieve some years ago by designing new approaches to work. BBVA did not play a passive role in the creation of the new headquarters, known as “La Vela.” La Vela is the endpoint of a process of thorough introspection, in-depth familiarity with the various profiles of our professionals, and the internal renewal that we demand of ourselves to remain competitive in the new digital era. In addition, we engaged in an open dialog with the architects, who contributed broad-ranging experience and expertise, and a distinctive esthetic and philosophical vision. A 19-storey tower, 93 meters high. The name of the building was not chosen at random. To get our people involved, we ran an open competition. We wanted a simple, short, easily remembered name with universal, positive connotations. The final choice couldn’t have been better. In fact, the name of the tower—La Vela, or “the Sail”—is also the name of the whole complex. There are seven long, three-storey buildings, named after the continents, separated by alleyways named after seas and oceans. All the buildings cluster around a large central Plaza, measuring 100 meters across. Besides work areas, restaurants and services, this is the site of the visitor reception center and the auditorium. A services building where BBVA employees are provided with a kindergarten (for children aged 0 to 3), a sports center with a semi-Olympic swimming pool, a gym, and physiotherapy facilities. When addressing the design of what was to become La Vela, we realized that this was an opportunity to undertake an inspiring metamorphosis in our approaches to work, cooperation, and coexistence, our way of understanding new challenges in the banking industry, and our insights into how best to contribute to our host environment. We wanted La Vela to help drive our internal transformation, without losing sight of the need to be “good neighbors” in the Las Tablas district by lending our support to the urban development of northern Madrid. We did a lot of research to make sure the complex and our presence would be a model of corporate citizenship and add value to the community. We wanted residents to view us as part of their neighborhood. Our aim was to work with our neighbors to make sure our presence disrupted their day-to-day lives as little as possible. So we gave much thought to the services we could contribute to the area —something that would be of real use to our neighbors. 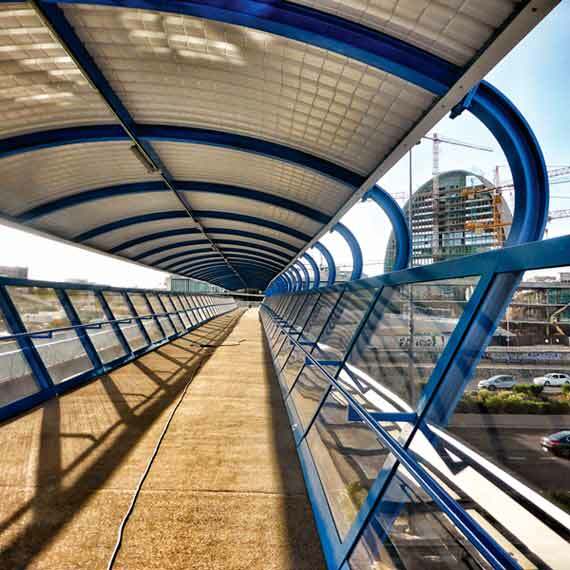 Some of the facilities built for our employees—such as the BBVA walkway—were accordingly opened to public use. BBVA has always contributed to the urban development of cities where it opens for business. In Madrid, BBVA has played a key role in the core areas of the city and their growth, as exemplified by our buildings on calle Alcalá, paseo de Recoletos, and AZCA—and, now, our new headquarters at Las Tablas. The drive towards renewal—which changes us both inside and out—is the true engine of this organization. This hallmark of the company explains our new strategy and the determination with which we are carrying it out. At BBVA we take corporate citizenship seriously, and this, too, is reflected in our new headquarters. The campus is certified to the ISO 14001 standard. We have also fulfilled the sustainability criteria required to achieve a LEED (Gold Level) certificate, one of the most demanding standards of sustainable construction. The building materials are low-environmental-impact and the complex is designed to support remote monitoring of energy usage. We installed rainwater collection systems on the roofs for landscape irrigation and greywater reuse. Our recycling collection points cover almost 100% of the waste produced. Construction was carried out using recycled steel and aggregates, and most of the wood was certified by the FSC (Forest Stewardship Council): this means it was sourced from responsibly and sustainably managed forests. Our complex is the largest in Europe to be lit using LED technology. This makes for 30% energy savings versus conventional fluorescent lights. The lighting management system saves a further 60% through presence detection and accounting for the contribution of natural light. The system automatically raises and lowers the blinds in response to the position of the sun and interacts with climate control devices to optimize temperature when spaces are left empty. The state of installations and energy usage are monitored in real time from a central control room, allowing for outstandingly accurate energy management and maintenance services. A large proportion of energy requirements are fulfilled using on-site renewable sources, such as thermal and photovoltaic solar panels and closed-loop geothermal energy, which draws on the stable temperature of the subsoil. Overall, our systems lead to 7.6% savings in carbon dioxide emissions and 8.3% savings in energy usage. Active chilled beams remove the need to generate and shift large volumes of climate-controlled air throughout the complex. Compared to conventional systems, this approach makes for 5%-11% energy savings. The chilled beams are equipped with micro jets which use induction to push air through cold/hot water batteries, thus achieving climate control without need of inbuilt fans. Beyond the chilled-beam system, climate control throughout the campus is designed for high energy efficiency and uses the highest-performance engines and production systems available on the market. The façade is made up of large, transparent, low-reflective, air-chambered glass panes shielded by strategically oriented outer slats. By acting as a filter for radiant energy from the sun the outer slats reduce the heat load inside our offices. These high-performance glass panes and slats minimize undesired energy losses and gains through the façade. Perhaps one of the most distinctive aspects of the project is the envelope of each building. 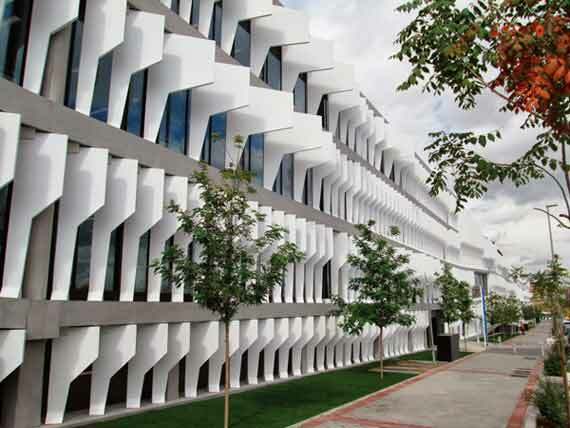 The façades reduce energy usage and integrate new structures with existing ones. With more than 49,000 m² of glass façade on campus, almost all office space is endowed with views of the surroundings or of inner courtyards. Employees are shielded from sunlight by a total 2,800 prefabricated slats which have been anchored to the structure in carefully calculated configurations. Rainwater captured on the roofs is channeled to treatment tanks and reused for irrigation. Wastewater generated by hand basins is reused for lavatory flushing, leading to a 50% decrease in the consumption of drinking water. Landscaping with a wide diversity of trees, plants and shrubs provides sound insulation for our buildings. The broadleaf trees in the Plaza provide shade in the summer while letting through sunlight in the winter. The climbing and hanging greenery in the inner “streets” shield pedestrians from the sun. The gardens have been populated with native plant species capable of surviving the dry local climate. The watering facilities interact with a system of canals and other cooling water features to encourage the emergence of microclimates. La Vela has more than 31,000 m² of green areas, close to 100,000 brushwood and shrub specimens, more than 400 hanging plants, and over 450 trees. The roofs are covered with extensive vegetation which requires minimal maintenance and reduces carbon dioxide emissions. The green roofs, combined with the fact that parking facilities are located underground and that campus materials are highly reflective, make for lower temperatures within the buildings and mitigate the “heat island” effect. On our way towards new approaches to work, technology is not just a facilitator—it can and should be an engine and accelerator of change. Like the other domains of BBVA’s end to end transformation, the process of technological upgrade focuses on people. Our starting point was to listen to our people to gain a first-hand understanding of their real technological needs, both present and future. This was no routine in-house survey: it was a far-reaching effort designed to elicit people’s personal motivation. We conducted interviews and use-case sessions with a twofold objective: first, to identify individuals’ needs targeting specific tasks; secondly, to ascertain what they wanted as managers of specific areas of BBVA. This approach resolves the person/employee dichotomy which might stand in the way of effective implementation. Rather than be imposed as a mere corollary of membership of an organization, the change we want to achieve must take place within each person. The process gave rise to stimulating concepts, such as “What I Need Today” —the service request system referred to earlier—“Bring Your Own Device” (BYOD) initiatives, and the perceived need for being permanently connected. This exploration and analysis enabled us to produce a comprehensive catalog of the technologies required to underpin the day-to-day experience of a BBVA employee. The compilation was drawn up on the basis of user experiences. For example, “What do you need for a videoconferencing session?”“What services would you like to see in your nearest digitization center?” The answers to these questions enabled us to write our Technology White Paper, which specifies the minimum experience that must be available at every point where an employee comes into contact with technology. The development of the White Paper has proved decisive in this process of internal change. One key conclusion was that the boundaries between physical and virtual workspaces were blurred. We also found that spaces and technology are closely interrelated, as are the new approaches required to achieve change. The technology infrastructure must be able to support basic requirements. This is something everyone took for granted during the interviews, but it truly is of the essence for everything to work. That infrastructure includes connectivity, communications, and the intelligence of the building itself (hundreds of kilometers of fiber optic, thousands of kilometers of cable, thousands of grid connection points and sensors, hundreds of Wi-Fi antennas, scores of electronics rooms, distributed data centers, etc. ), and must be implemented in step with the construction of the whole headquarters. The main purpose of the infrastructure is to support voice and data communications at any time and at any location. But it must serve other aims, too. Electronic development has led to a second internet revolution: what is now known as the “Internet of Things.” At BBVA we are getting ready to make best use of the potential this involves. A wide variety of sensors (presence, temperature, humidity, light intensity, etc.) have been installed at our headquarters; they are all connected to one another and controlled in a centralized way to allow for smarter energy management. They also let us analyze the way the buildings are used. The vast quantity of information captured by the sensors requires us to use Big Data techniques to sift through it for patterns and anomalies in various parameters. We can then find ways to improve service standards and human factors. Our transfer to a new headquarters involved moving not just equipment but also a mass of information. Some of the company’s data is in the form of decades-old sheets of paper. For legal reasons this content must be preserved; but it doesn’t fit in with the design of the new digital environment. We accordingly set in motion an ambitious digitization scheme. We saved costs in terms of paper and storage space, shortened implementation timeframes and acquired new capabilities in digitization. To achieve comprehensive digitization and avoid the use of paper entirely we designed spaces called “digitization islands,” which provide all the necessary services to port paper documents to electronic files. People can then work with the documents from any location and share them quickly and easily. Digitization islands also let you print—it’s not forbidden, and nobody will call you out for it—but we have found that printing decreases exponentially when easier and more efficient methods become available. At the new Group headquarters in Madrid we attained an 80% reduction in the space given over to storing paper, and moved on from a ratio of one personal printer for every 1.5 people to one printer for every 50 people. Thousands of personal printers have been replaced by a few hundred digitization islands, thus drastically reducing the environmental impact of ink cartridges and the use of tons of paper. A key challenge when deciding what technology is needed in the new dynamic, collaborative spaces is identifying the requirements of meeting rooms. It is here that the convergence of the three aspects of the project—technology, spaces, and culture—becomes most visible. Our chosen solutions start out from the initial step of booking a venue. A single process has been put in place so that you can book a room anywhere in the world (regardless of your own location at the time), tie services into your booking (videoconferencing, catering, etc), invite the attendees, and share the relevant documents with them. Our people’s jobs entail frequent mobility; when someone cannot be physically present at a meeting we need to put them in the room in virtual form. In addition to providing telephone and videoconferencing communications, digital workspaces must be shareable and support remote co-editing. We have in place state-of-the-art audio conferencing, videoconferencing and remote-presence systems, as well as collaborative video call solutions that meet a variety of needs. To make sure that all this complexity is transparent the systems are interoperable. Within one and the same meeting you can link a telephone call to a videoconferencing session and a hangout, for instance. 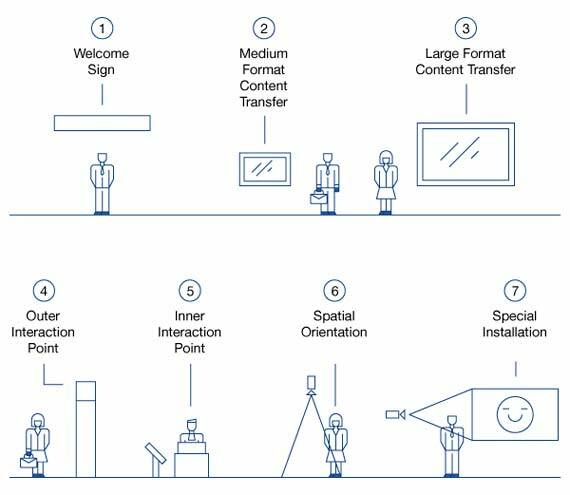 In years to come, all screens and video walls in all our buildings will be “smart,” providing personalized information and multiple forms of interaction (gesture, voice, touch and personal devices). When the “interactive window-dressing” concept is combined with personal identification devices and location-based services, you could say that at BBVA you’re not necessarily crazy if you “talk to the wall”! It is increasingly common to see people wearing sport wristbands, smart watches, augmented reality glasses and devices that track the body’s vital signs. These gadgets supply us with information about ourselves and our environment. They are even able to send out an alert into the environment about our own situation—this could prove a lifesaver in medical emergencies. The possibilities of this technology are already being tried out in day-to-day life at La Vela. We are testing a new visitor accreditation system using Google Glass to streamline the process and shorten visitor waiting times. Interior location-based services currently depend on a complex system of beacons. In a couple of years, La Vela will be “aware of itself” and “know” everything going on within it. At any given time, the building will know where each person and object is located. One potential benefit among others will be that we can respond more effectively to emergencies and events requiring evacuation. The BBVA Collaborative Environment is a desktop in the cloud. Any employee can access their own information and shared files from any location, at any time, using any device. This secure cloud-based platform lets people quickly roll out the solutions needed at the given time. With a single click the Collaborative Environment administrator can make a new app available to the bank’s 110,000 employees, who can use it instantly, without need of updating. These capabilities are unlimited. The processing and storage capacity of the cloud is infinite, and there’s no need to deploy new infrastructure. Leaving aside the technical details of the digital environment, the key is that it was designed with an eye on the needs pyramid of its users. 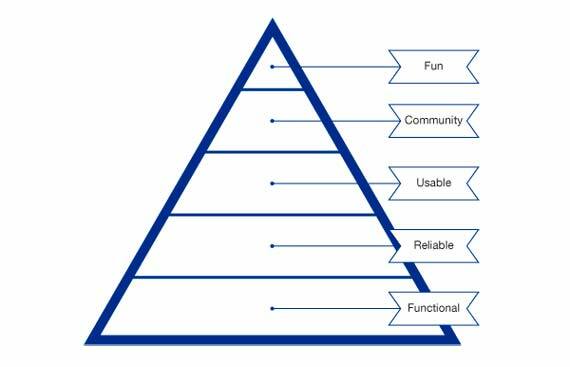 The pyramid sets up an order of priority for the various elements of the Environment, ranging from mere function (Functional) through availability in all contexts (Reliable), assurance of a unique user experience (Usable), and collaborative work before individual work (Community), to the top of the pyramid—an enjoyable experience (Fun). Another hallmark of the Collaborative Environment is extreme personalization. Minor details such as menus and personalized alerts, configurable sections and user profile pictures help people to acquire a sense of belonging to the Collaborative Environment and to manage their own desktops. The platform also supplies all the tools required to safeguard the confidentiality of the data handled by each person: information is shared according to a scheme of different roles and permissions. The bedrock of the Collaborative Environment is the power of data to provide users with unique experiences. For instance, the search engine embedded in the web-based desktop uses heuristic algorithms that generate results in line with the given user’s specific search patterns and successful past searches. Another example is that when the documents linked to a user are viewed by someone else, a permission-based filter comes into play. All user interactions with the Environment are logged and made available for analysis in the aggregate. This means we can identify usage patterns with a view to developing new functionalities. What’s more, the fact that the social network ties in with every element of the Environment makes collaboration among users in each functionality a reality. You can comment on company news, vote in favor of other people’s initiatives and create special-interest communities. Integrated use of the social network within the Environment creates a new model of company/employee relationship, and new communication channels among employees themselves. The concept of a “digital community” has thus emerged for the first time at BBVA. The web-based version of the Collaborative Environment provides access to all the tools you might need for day-to-day tasks: email, directory, documents, news, BBVA social network, and management applications. In addition, you can share and co-edit documents and place information in personalized folders (“My Tasks” or “My Projects”). In a hyper-connected world the Collaborative Environment supports BBVA employees wherever they go by means of a corporate smartphone with an ecosystem of native apps offering equivalent functionalities. This ties in with the “personal assistant” app. For example, the app looks at traffic conditions to tell you what time you need to start making your way towards a meeting to get there on time. The concept involves a shift in the role of a particular category of employees. The traditional personal secretary role has evolved towards a team assistant role. Through specific training in new collaborative tools these employees can become “viral” agents for change. For BBVA, technology is a means, not an end in itself—it should therefore never be viewed as a status symbol. Equipment is allocated to our employees on the basis of need, not rank. To meet their needs, we identify two main axes: mobility and portability. “Mobility” means immediate access to information within the Collaborative Environment and immediate connection to colleagues. So mobile devices (tablets and smartphones) are allocated to all employees. “Portability,” however, means access from outside the workplace to systems containing sensitive or confidential information. This type of access must be protected by security safeguards as to data authentication and transfer; we achieve this using appropriate security filters, encryption and app virtualization. Employees requiring this kind of access receive latest generation ultra-books. Desktop computers are allocated to employees who do not need to use those systems except when at their workstations. We cannot ignore the Bring Your Own Device (BYOD) trend. Mechanisms are in place—information authentication and encryption systems—so that personal devices like smartphones and tablets can be brought securely into workplaces. Once a given individual’s equipment has been allocated, it becomes a priority to ensure that they can use its full potential. A prerequisite for this to happen is a change in personal attitude towards technology. Our “citizenship” of the digital world requires us to have a “digital identity” where our personal values are consistent with our professional values. In the world of work today, being digital is no longer a choice—it is now, and will continue to be in future, a duty. To develop our digital identity, we need to move forward on two fronts. First, we need to handle our equipment’s hardware and software as adeptly as a digital native. The new tools of the digital era provide professionals with more independence, but also require a longer learning process. We need to self-manage the security of our personal and professional information, monitor our own image on social media, edit files effectively, be aware of the uses of mobile apps, etc. Secondly, we need to develop new skills, such as active listening, critical thinking, and assertive communication. To guide people along this path, BBVA runs specific training actions. The technical support service is located in common areas, spread across a number of highly visible booths called “Smart Techs.” Smart Techs are always open and available to deal with queries and issues with devices and software. These new technology spaces are highly effective for many reasons. People are far more receptive to advice and training when they approach tech support on their own initiative. The outcome of the advice is then shared across our knowledge communities, which means other colleagues can identify the solution when a similar issue comes up. Going still further, the digital medium itself provides a tech support point. We have launched a help website where tech support experts and users can publish and view tutorials. We created a community on the BBVA social network through which employees can make suggestions and help solve one another’s problems. Page views for this community have risen exponentially from the very first day it came online. Actions requested from the “official” tech support service have decreased—this is a robust indicator of effective collaboration, which shows that the process of transformation has already begun and will accelerate from now on. The extensive literature on collective intelligence agrees that organizations’ most important asset is knowledge. This insight is even more relevant today, because knowledge is the engine that drives emerging technologies. Information technologies let us manage our knowledge, but in themselves create nothing. The key is to get people to collaborate with one another. This has a lot less to do with IT platforms than with a change of mindset: a change of culture. This is why companies need to create a framework that nurtures the new collaborative paradigm. To be genuinely effective and embed the collaborative spirit in the organization’s DNA, that framework must be accurately aligned with corporate culture and be fully consistent with it. By linking together new technologies—like Big Data, cloud computing, artificial intelligence and smart devices—we can create predictive models to diversify and personalize our services and deliver them effectively to consumers. It is not enough to create and distribute a product or service, however excellent it may be in itself. We need to satisfy customers’ emotional needs by giving them an experience that goes beyond their expectations. Thanks to social media “virality,” digital businesses have turned good user experiences into a global movement that favors those businesses’ interests. The traditional rule was that a satisfied customer would report their good experience to their social circle less than half the time that an unsatisfied customer would report their bad experience. The internet, however, means that both good and bad experiences can reach millions of potential consumers. Customer experience is key, and its design has become a strategic function within a company. Over the past decade design has moved on from being a purely esthetic discipline to guiding everything that a successful digital company does, starting with the service concept itself. To deliver the best possible customer experience we need an accurate understanding of customer behavior and motivation. Traditional know-how must be enriched with disciplines which the business world has so far ignored, such as anthropology, sociology, and psychology. For such a wide range of disciplines to be addressed successfully we need a team with the right talents and the ability to work collaboratively. To align the members of a multidisciplinary team with a common goal the work to be done must be rigorously organized, and there must be a consensus on a robust evidence-based decision-making process. The principles of Design Thinking are best suited to the situation. The first step in the method is to gain insight on customers (what they say, do, think, feel and, finally, believe). Next, the team develops a wide range of creative alternatives for reaching customers. Finally, the best approach is selected on an objective basis. After the customer experience has been fully designed, it must be made a reality. The construction of digital products and services requires tech profiles in many different fields (security, data, coding languages, etc.). Technology departments traditionally worked in sequential, non-overlapping phases: technical design, programming, testing, deployment, and so forth. This approach is now obsolete because it is too slow to respond to new market demands. In the digital age, everything is in real time. Given a context where things happen immediately, delay in developing the chosen design solution is simply not an option. A company can take the lead in its market and then be driven out of it altogether by being too slow to launch its next product. Similarly, a late response to a customer risks destroying their loyalty to the brand. To make development more agile, the construction of the design experience should be divided into blocks of product functionalities that customers perceive as valuable. This division allows for several small development teams to work swiftly and in parallel. The end product is built by successive approximations, each of which is improved using customer feedback after each iteration. The teams involved work collaboratively in short cycles, in the awareness that every decision they make directly impacts final customer satisfaction. In the field of software development “Agile” methods such as “Scrum” make a perfect fit with these new and far more dynamic approaches to work. Team-based structuring and correctly delimiting blocks of tasks are the toughest propositions in the process of implementing new approaches to work. To be effective they cannot be limited to a rethink of organizational structure. There needs to be a change of mindset and behavior in employees themselves. One of the outcomes of this new way of designing and building products is that empowerment arises naturally, because in order to create an experience that fires up the customer’s enthusiasm the multidisciplinary team makes a wide range of strategic decisions. The presence of all the disciplines involved throughout the various stages of designing and building the product or service ensure that the changes called for after each iteration are implemented in an agile and coordinated way. The greater the number of people adopting collaborative work dynamics within an organization, the higher their ability to synchronize delivery timetables. This is the way to build a more dynamic organization step by step, which gradually becomes a genuinely digital company. New approaches to work clearly require new environments to be implemented intuitively and effectively. At BBVA we have designed specific collaborative rooms to accommodate Design Thinking and Agile work methods. These are multipurpose spaces in both the physical and digital senses, bringing together people trained in different disciplines who are working on the same project, even when located in different buildings or even cities. The features of a collaborative room go far beyond audiovisual media and videoconferencing facilities. They are constantly evolving “living labs” where you can experiment with a range of tools, like digital whiteboards and furniture arrangements, until you find the setup that best fits the specific needs of the project in hand. Project participants who are physically absent can write on the same “whiteboard” and on the same “sheets of paper” as the people actually sitting in the room. Another plus point is that you don’t need to set up and then undo the arrangement within the room for each project you are working on, as would normally happen using physical equipment alone (panels and whiteboards). The content collaboratively generated during the session is saved in the cloud until the project team’s next meeting. Adopting new work habits isn’t easy, but it’s perfectly possible. Science has shown that the brain continues to form new neural pathways and modify existing ones in order to learn, create new memories, and adapt to new experiences. For the process of change to make real headway, though, it isn’t enough for people to change their habits as individuals. It is also necessary to create working teams that can serve as benchmarks for the rest of the organization. Creating multidisciplinary teams is powerfully aided by global People Management processes. It is important to get to know each professional as an individual, but it is just as crucial to create the opportunities for people themselves to take the initiative and seek inclusion in collaborative teams. BBVA’s internal job posting app, Apúntate (“Join In”), has made a meaningful impact on talent mobility within the company. It is people themselves who, using the platform to find out if their skills and experience make a good fit with the given project, take the initiative to join the new team. As a rule and wherever possible, BBVA favors internal development over hiring externally. The speed at which the environment is evolving calls for ongoing learning to safeguard the competitiveness of organizations and individuals alike. Every employee must be provided with the tools they need to manage their own development plan autonomously, and open the door to the best training resources. In this respect BBVA’s scheme combines highly specialized training with more general programs aimed at the entire Group. In both cases courses are taught by leading institutions such as Wharton, Chicago Booth, Babson College, The Aspen Institute España, IESE, LECE, TEC de Monterrey and the CFA Institute, among others. BBVA uses a wide array of training media. E-learning, for instance, is a universally accessible resource that provides a flexible and self-managed learning pathway, enabling our people to decide for themselves as to the scope and pace of their own training. In this context, one alternative that opens up possibilities which would be hard to find by conventional means is provided by Massive Online Open Courses (MOOCs). This form of training, now being tested at BBVA, is set to become a revolutionary educational tool in the coming decades. To give a wider echo to inspiring ideas we invite all our teams to a broad range of conferences—recurring schemes hosted by the Group itself include TEDxBBVA, Fronteras del Conocimiento, BBVA Research, Business Traveler and OpenMind. Talent finds support in high-quality intellectual exercise. Another vector of transformation and knowledge is human emotion. A positive attitude to a process of change raises your ability to learn and embrace new approaches to work and new ways of relating to others.10 This fact, as well as neural plasticity, implies that emotional intelligence is a learnable skill. If education in general is a process of “learning for life,” then emotional education lies at its core, because it supports personal well-being and enables us to understand where our real limitations lie. Effectively managing our emotions brings us meaningful benefits. A broad range of research has shown that emotional skills are twice as good at garnering outstanding performance than intellect or experience. Emotional intelligence gives rise to better leaders and bolsters the engagement of working teams. An individual who is happy to work for his or her company works more productively. The idea is to foster an environment where people feel recognized and can develop their full potential and creativity. They should be able to find meaning in their jobs and feel proud of the company they work for. At BBVA we believe it is vital that our teams feel engaged with and enthused by our business mission. So it is now an established practice with us to pay real attention to the emotional backdrop of the employment relationship so that people feel valued and recognized. In addition we encourage our people to support the progress of the community at large by taking part in corporate voluntary work. Our concern with our working teams—which we implement in the framework of a corporate program called Pasión por las Personas (“A Passion for People”)—has meant that in 2013 the consulting firm Great Place to Work named us as one of the 25 best multinationals to work for in the world. At BBVA we want the process of adopting new approaches to work to be supported expressly and consistently, and to feed through to our performance as soon as possible. To mobilize the organization in that direction, the first step was a major awareness raising effort, particularly among employees having people-management roles. They are the main “agents of change” and must set an example. The campaign was guided by the creative concept Make It Happen! and, to one extent or another, involved everybody who works at BBVA. In light of the importance of symbolic gestures in a process of change, in 2010 we became the first European company to provide tablets as working tools to every member of management, thus laying the groundwork of the “paperless” concept. The process was bolstered by a range of actions designed to encourage a more innovative and participation-oriented style of leadership, break down traditional departmental structures and foster a more open and collaborative form of communication. To achieve a more open and democratic culture of communication driven by people themselves, we set in motion an internal platform dubbed Ask & Vote. This electronic channel lets you send questions to senior Group management and vote and comment on other people’s questions. Every quarter the CEO chairs a webinar to address the issues that employees are most interested in. We must help people acquire new knowledge, deal effectively with digital environments and develop new skills like active listening, critical thinking, and collaboration. We also need to support them when they apply the lessons learned to form new habits and behaviors. Not everybody is equally willing to accept change and adopt technology. The psychographic distribution described by Geoffrey Moore in his book Crossing the Chasm—about the specific aspects of selling high-tech products in their early days—also takes place to some extent within organizations. It is for this reason that the shift in the way we work and in our mindset has been implemented using an inclusive approach that looks at the needs of everybody within our organization. As we have said, technology—though a powerful catalyst—is not enough in itself to change a company. It is people, especially those in management positions, who make change a reality and, by providing a role model, lead the way to a more open, collaborative and innovative culture. The BBVA Collaborative Environment has led to a key cultural shift by creating a transparent relationship model. Everybody knows what everybody else is doing. Knowledge management finally becomes real: since the platform was set in motion, more than 11 million documents have been shared, and the figure is growing exponentially. One of the hallmarks of the platform is its ability to support knowledge communities, which are integrated with the rest of our collaborative tools. 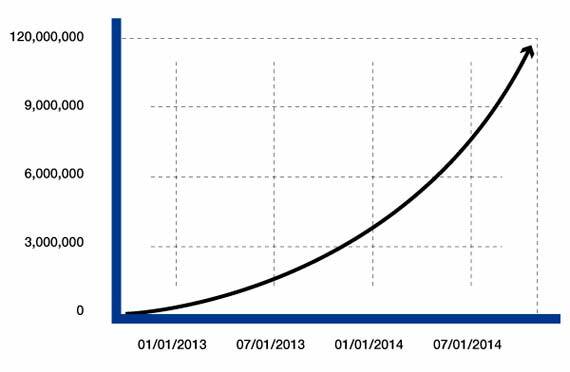 Deployment began in January 2013 and continues step by step. Membership of the BBVA community is voluntary. In September 2014, 73,000 employees had access to knowledge communities, 21,500 of whom had created profiles and were actively using the feature. Collaborative work is not restricted to the internal sphere: it reaches beyond the company itself. Examples of this outreach include BBVA Innova Challenge Big Data, an event open to developers around the world with the aim of creating apps, services and content based on vast amounts of anonymized credit card transaction data. The initiative—the first of its kind in Spain and Mexico—is an open innovation exercise that has brought us into contact with new ideas and talent. Becoming an increasingly digital bank means we also have to convert the data about our own employees into useful knowledge. Our human resource teams use HR Analytics techniques to develop predictive models to foresee key talent gaps in the near future. The end goal of these efforts is to identify the professional profiles and leadership styles that contribute the greatest value to customers and the business. The rethinking of BBVA to face the digital era is now in motion. It entails a far-reaching transformation of the entire Group. Radical improvement of technological capabilities is essential to the process. This, however, is a necessary but not sufficient condition. The key to success lies in the cultural mindset. An in-depth change must be achieved in the way things are done throughout the organization. The new BBVA headquarters have become a powerful tool in this process by encouraging people to change their mental frameworks, both in terms of day-to-day work and of the symbolic impact of the new venues. La Vela and the other cutting-edge sites built by the Group inwardly and outwardly convey our determination to lead the transformation of the financial services industry, and in themselves meaningfully contribute to that transformation. The BBVA New Headquarters Team, who produced this article, comprises Iván ARGÜELLES CARRALERO (Observatory on Lean Management and New Approaches to Work), Gloria LAMAS RULL (Head of BBVA City), Beatriz LARA BARTOLOMÉ (Head of Corporate Transformation), Susana LÓPEZ ARIAS (New Headquarters Project Leader), Belén PISERRA de CASTRO (Head of Corporate Buildings and Services), and Alfonso ZULAICA ALFONSO (Head of Corporate Culture). The strategic formulations and actions described in this article are the outcome of the expertise and effort of hundreds of BBVA employees who are committed to developing New Approaches to Work at BBVA. The authors of this article are members of that broadly-based team that undertook this project, drawing on the various disciplines in play. We should like to express our special thanks to Juan F. Cía, David Zafrilla, Angel Galván, Abdallah Aberouch and Carlos Benítez Donoso for their valuable support. Collaborative work can be expressed mathematically as Nx[2 (N-1) – 1], i.e., the sum of interactions among N people. For example, five people can come up with five ideas individually. But when they work as a team they can generate ten ideas through cross-interactions among them. However, when they work collaboratively, they can work in parallel —individually, in pairs, in groups of three or four, or as the full group of five. Under this approach the sum of their interactions is 75. We should like to acknowledge the work they are doing and thank them for sharing it with the BBVA New Approaches to Work team. Our thinking has been stimulated by visits to the headquarters of Apple, Cisco, IBM, Microsoft, Telefónica, Repsol, Google, SRI, Commonwealth Bank of Australia, Macquarie Bank, Zara, and other companies. LEED certificates: Campus BBVA in Madrid, Spain (Gold, 2012); BBVA headquarters in Asunción, Paraguay (Silver, 2010); Gold in the United States, at 5576 Grove Blvd. (Hoover), 430 NM Hwy 528 (Bernalillo), 8333 Douglas Ave. (Dallas), 2200 Post Oak Blvd (Houston), 2640 E. Harmony Rd. (Fort Collins), 15580 E. 104th Ave. (Commerce City), 2707 W. Lake Houston Pkwy (Kingwood), and 4868 Garth Road (Baytown); Silver, 2012, for 10923 E. Baseline Road (Mesa, US) and a 2013 certificate for 1703 West 5th Street (Austin, US). ISO 14001 certificates in Spain: Castellana 81 (Madrid), Gran Vía 1 (Bilbao), San Nicolás 4 (Bilbao), Recoletos 10 (Madrid), Plaza de Santa Bárbara 2 (Madrid), Manoteras 20 (ICh) (Madrid), F. Mompou 5 (LT-I) (Madrid), Pza. Catalunya 5 (Barcelona), María Tubau 10 (LT-II) (Madrid), Batanes 3 (Tres Cantos), Santa Bárbara 1 (Madrid), Gran Vía 12 (Bilbao), Alcalá 17 (Madrid), Isla Sicilia 3 (Madrid), Clara del Rey 26 (Madrid), La Palmera 61-63 (Sevilla), Pza. Ayuntamiento 9 (Valencia), Campus BBVA (La Moraleja), Isabel Colbrand 4, Castellana 79, Rambla d´Egara 350 (Terrassa), Monforte de Lemos s.n. (Vaguada) and Ciudad BBVA (Phase I). Certificates in other countries: ISO 14001 in Buenos Aires, Argentina; Venezuela 538-540, Reconquista 199, Reconquista 40, Maipú 356, Reconquista 281, Alsina 1717 and 60 other offices. In countries where the word “discoverer” might bear a negative connotation, other terms were used (“pioneers,” “facilitators,” etc.). J. Collins, Good to Great: Why Some Companies Make the Leap—And Others Don’t (New York: Harper Business, 2001). R. Connors and T. Smith, Change the Culture, Change the Game: The Breakthrough Strategy for Energizing your Organization and Creating Accountability for Results (Portfolio Trade, 2012). B.D. Johnson, Screen Future. The Future of Entertainment, Computing, and the Devices We Love (Intel Press, 2010). D. Kahneman [winner of the Nobel Prize in Economics], Thinking, Fast and Slow (New York: Farrar, Straus and Giroux, 2011). D. Kelley and T. Kelley, Creative Confidence. Unleashing the Creative Potential Within Us All (New York: Crown Business, 2013). T.W. Malone, The Future of Work. 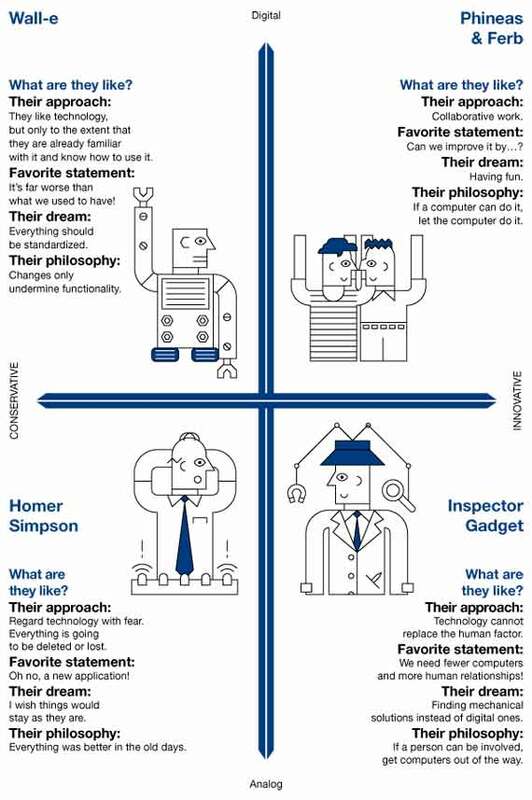 How the New Order of Business will Shape Your Organization, Your Management Style, and Your Life (Boston: Harvard Business Review Press, 2004). G.A. Moore, Crossing the Chasm (New York: Harper Collins, 1991). K. Sheridan, Building a Magnetic Culture. How to Attract and Retain Top Talent to Create an Engaged, Productive Workforce (New York: McGraw-Hill, 2012). C.-M. Tan, Search Inside Yourself (London: HarperCollins, 2012). C. Taylor, Walking the Talk. Building a Culture for Success (London: Random House Business Books, 2005). 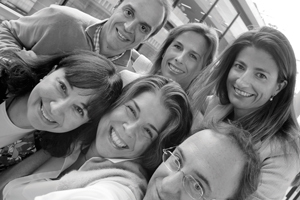 The BBVA Headquarters Team. 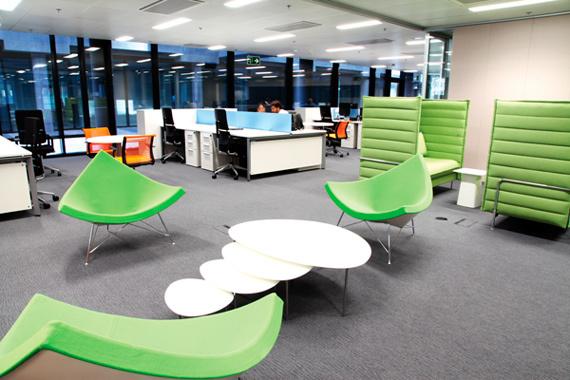 "New Workplaces for BBVA: Promoting a Culture of Collaborative Work." 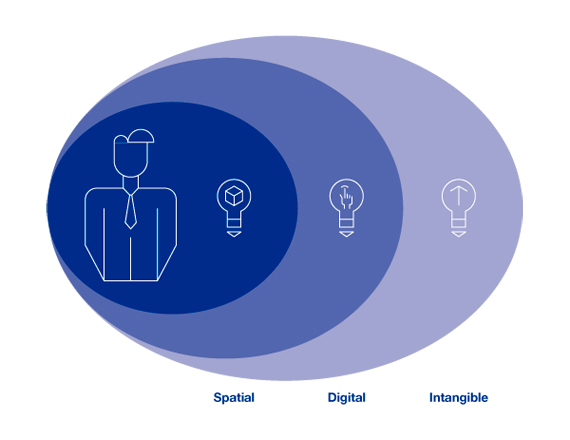 In Reinventing the Company in the Digital Age. Madrid: BBVA, 2014.